Top Gun 3D Blu-ray Review With a stellar 80's cast, Top Gun is also a film that can be watched by purists and newcomers alike as it has been reborn for 2013. On March 3, 1969 the United States Navy established an elite school for the top one percent of its pilots. Its purpose was to teach the lost art of aerial combat and to insure that the handful of men who graduated were the best fighter pilots in the world. They succeeded. Today, the Navy calls it Fighter Weapons School. The flyers call it TOP GUN! The 1986 action blockbuster that cemented Tom Cruise as one of Hollywood's greats has landed on Blu-ray 3D which not only boasts high definition but glorious 3D. As soon as the disc loads on your 3D Blu-ray player and the film starts playing, the video quality is outstanding and one could easily be mistaken in thinking that it was filmed yesterday, opposed to almost 27 years ago. 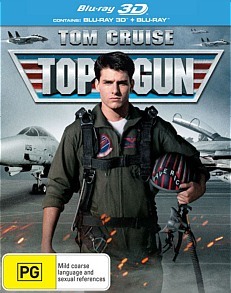 Top Gun is a classic 80's film and revolves around the relationship between Maverick Mitchell (Tom Cruise) and civilian instructor Charlie (Kelly McGills) who has been called in to remove the cockiness of these pilots. Also joining Maverick is best friend Goose (Anthony Edwards) and rival pilot Iceman who is played perfectly by Val Kilmer. Interestingly enough, Top Gun is a dubbed as an action film but is more a melodrama which focuses on the relationships, both good and bad of these pilots and the "unnamed" enemy. However the testosterone rival between Maverick and Iceman creates a rift between the pilots that leads to an almost predictable plot and clichéd ending of who or whom will become Top Gun when they need to man up. It's a classic 80's action film that features bar fights, romance and an excuse for Tom Cruise to ride a Kawasaki Ninja 900 as a hero with attitude but with his moral compass pointing in the right direction. Top Gun also had one of the best soundtracks to date with Take my Breath Away for the romance and Highway to the Danger Zone for those awesome flight scenes. 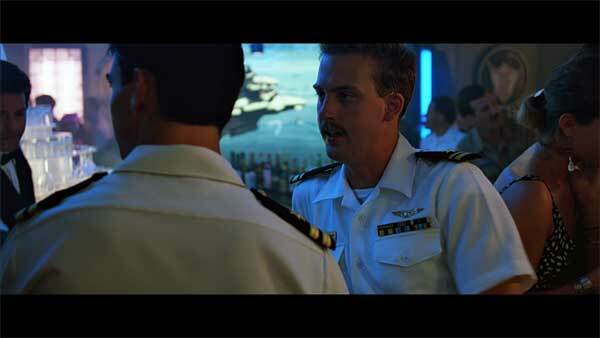 Converted by Legend3D, this company did an amazing job at turning a 2D film into 3D and where this is most noticeable in the film is during the last 30 minutes of Top Gun. The flying sequences are truly quite stunning and the illusion of depth really stands out as the planes whiz by, leaving their heat trail. 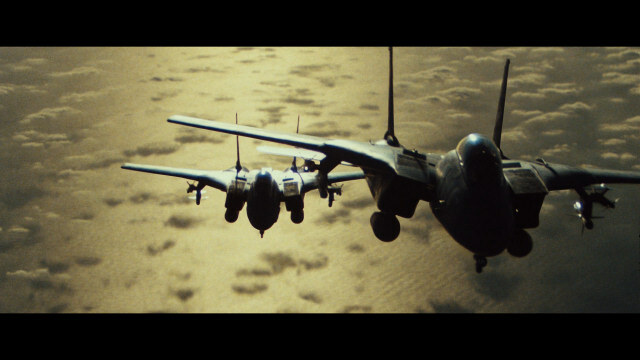 However it should be noted that Top Gun 3D cannot compare to a modern 3D movie but Legend3D should be commended on the conversion, especially those standout 3D moments which showcase the amazing cinematography of those aerial scenes, especially the dogfights. Compared to the previous release, there is still some grain, however the video quality provides sharp and vibrant images with an updated palette of colours. Audio is equally impressive with a 5.1 Dolby TrueHD soundtrack that really blasts your surround sound system from not just the powerful sounds of jet engines but the pumping 80's soundtrack. Dialogue is crisp, perfect and the overall levels of the sounds have been well mixed, without one being dominant over the other. Given that, Top Gun is definitely a film that should be played with your surround sound on as it definitely increases the overall Top Gun experience. Apart from the Blu-ray 3D Feature Film, this release of Top Gun contains a second disc with a plethora of special features. The most impressive feature of the special features is the audio commentary by producer Jerry Bruckheimer, Director Tony Scott (brother of Ridley Scott) and co-screenwriter Jack Epps and two former military advisors who were used as technical advisors. Listening to the commentary shows how much dedication they put into Top Gun in trying to make it a realistic action movie. 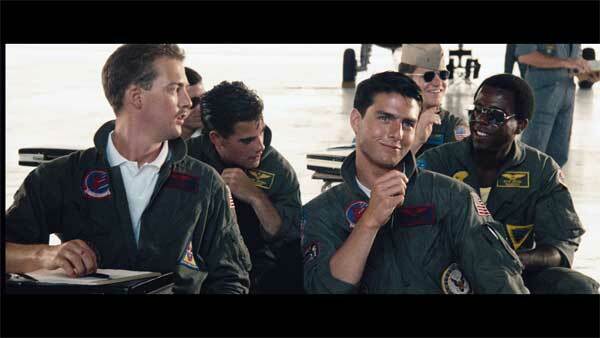 It's a fun a group of individuals who add to the Top Gun mythology. Other special features include multi-angle storyboards with commentary by the late Tony Scott, featurettes that include inside the real Top Gun, Behind the Scenes, Survival Training plus Music Videos, TV Spots and an interview with Tom Cruise. For a film this old, it's good to see that Paramount have ensured that the special features are interesting and engaging. If you're a fan of Top Gun than this is a must have release from Paramount who have successfully converted this film to 3D with improved video quality that truly compliments the 80's story. 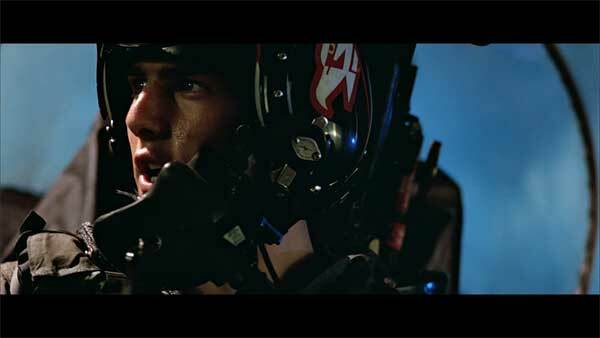 Even though there are clichés and at times a predictable plot, there's something innately special about Top Gun that makes it a fun and memorable movie. With a stellar 80's cast, Top Gun is also a film that can be watched by purists and newcomers alike as it has been reborn for 2013.